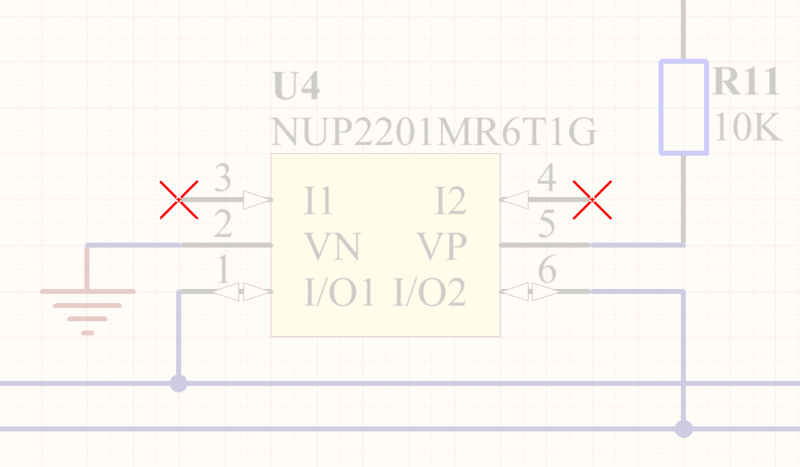 Use No ERC markers to suppress error/warning messages about a specific node in the circuit. The No ERC marker is placed on a node in the circuit to suppress all reported warning and/or error violation conditions that are detected when the schematic project is compiled. Use this to deliberately limit error checking at a certain point in the circuit that you know will generate a warning (such as an unconnected pin), while still performing a comprehensive check of the rest of the circuit. The No ERC marker supports a number of different styles, and can be displayed in any color. Use this ability to reflect the design intent for this point in the circuit. Choose a No ERC style that best reflects its function at that point in the circuit. No ERC markers are available for placement in the Schematic Editor only, by clicking Home | Circuit Elements | from the main menus. Position the cursor over a wire or other net object and click or press Enter to place a directive at that point in the circuit. Continue placing further No ERC markers or right-click or press Esc to exit placement mode. To rotate the No ERC marker while in placement mode, press the Spacebar to rotate anti-clockwise in 90° steps, Shift+Spacebar to rotate clockwise in 90° steps. Press the Tab key to access an associated properties dialog, from where properties for the No ERC marker can be changed on-the-fly. 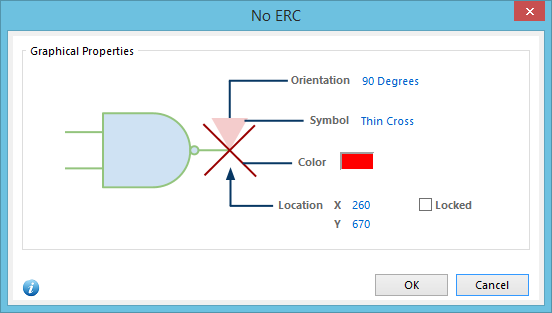 This method of editing uses the No ERC dialog to modify the properties of a No ERC object. By default, No ERC markers are included during printing. To control this - either disabling their inclusion entirely, or excluding only specific symbols - use the Schematic Print Properties dialog, as shown below. Control the printing of No ERC markers in the Schematic Print Properties dialog. Print Preview - from the Preview Schematic Prints dialog, right-click and choose Configuration. Page Setup - from the initial Schematic Print Properties dialog, click the Advanced button. Default Prints - from the Defaults tab of the Options for Project dialog, select Schematic Prints in the list, then click Configure.